Typical inflammatory reactions are initially localized to a minute area (Fig. 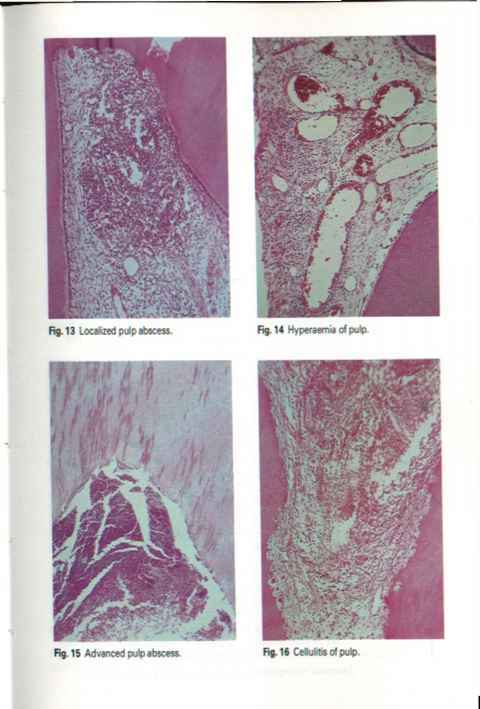 13) but typically lead to necrosis of pulp due to restriction of blood supply by the apical foramen, compression of vessels by oedema in the confined space and thromboses. Pathology • Predominantly mononuclear inflammatory cells (lymphocytes, plasma cells and macrophages). • Initially localized pulp damage. Destruction of pulp is often relatively slow. • Often an incomplete calcific barrier around inflammatory focus. • Usually, necrosis of pulp eventually results. Wide exposure of the pulp by carious destruction of the crown may allow it to survive by relieving the pressure of exudate. Survival of pulp in these circumstances may be more likely in teeth with open, incomplete apices. Inflammation extends throughout the pulp, which becomes replaced by granulation tissue (Fig. 17). 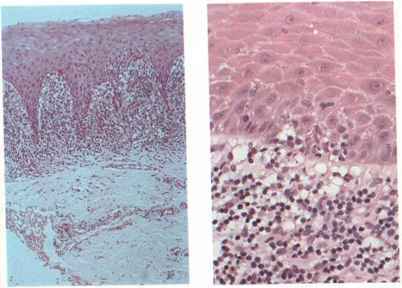 Pathology Granulation tissue may proliferate through the exposure and become colonized by epithelial cells. Proliferation of the epithelium may lead to the formation of an almost complete covering, allowing subsidence of inflammation beneath (except at the margins in contact with the edges of the carious dentine and plaque) and progressive fibrosis of the mass. The pulp polyp (Fig. 18) thus formed appears as a pink or red nodule protruding from a wide exposure. Destruction of nervous tissue in the mass renders it insensitive. • Secondary to pulpitis. Calcifications may form at the border of localized low-grade pulpitis and coalcscc to surround it completely (dentine bridge). However, the bridge is permeable and inflammation extends beneath it (Fig. 19). Dentine bridges, seen on X-ray after pulp treatment, do not necessarily therefore indicate complete healing of the underlying pulp. • Diffuse granular calcification. Fine calcifications may progressively extend through normal pulps and fuse to form large masses (Fig. 20). They are of no clinical significance. 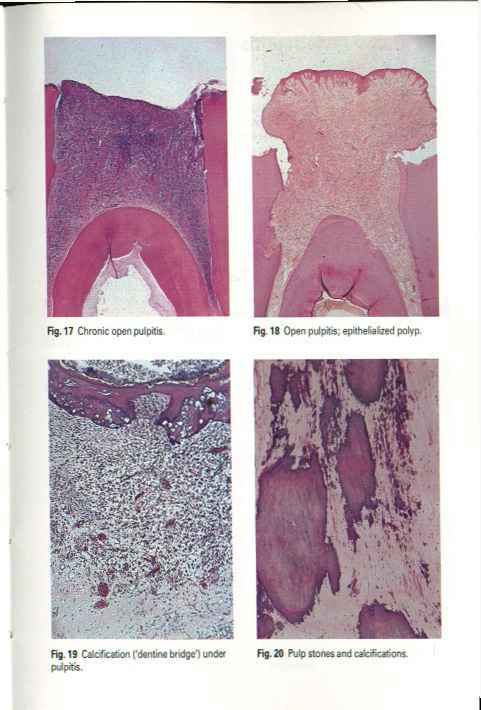 Internal resorption: (see p. 13 and Figs 25-27, p. 14).